Carrying cases are available in sizes designed to fit your radio and battery and permit audio to be heard clearly. 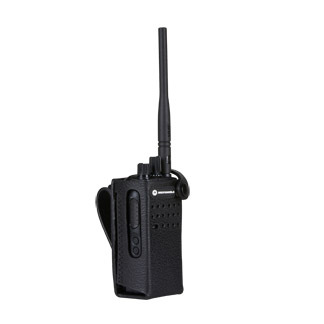 This hard leather case with 3-inch fixed belt loop is designed for the XPR 3300 non-display radio. Belt loop and nylon cases feature "D" rings that allow the cases to be attached to a carrying strap.